As promised last week! 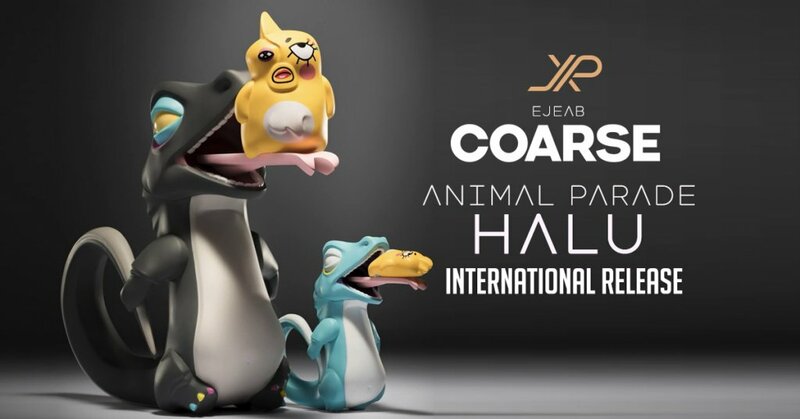 Animal Parade 3 : Halu เหี้ย Set by JPX x COARSE x Ejeab gets an International Release date! Blessing for all the collectors who couldn’t make it to Thailand Toy Expo 2018 as reserved stocks for the set will be made available over the weekend. Please note the sets will have a limited availability. Last year we saw JPX x COARSE showcase the prototype of “VARANUS” at Thailand Toy Expo 2017 which you can check HERE. A couple of weeks ago a surprise was revealed! Meet Halu/ เหี้ย, in collaboration with Thailand’s famous social critic and webpage called ejeab (อีเจี๊ยบเลียบด่วน). The version was aTTE is exclusive for Thai fans and the yellow chicken is a character of a super famous Thai news and social critic. he will even eat shampoo. he might be eating you! ONLY for international customers who interest in Halu /เหี้ย set ( big and small versions included in the set), JPX will start selling on May 12th, 2018 at 21.00 (9pm Thai time) with the price of 5100 baht /set (not include shipping cost). Online release via Google Document release on JPX Facebook HERE. Please note Google form will be shown on the day of the release. Please note PayPal fee is NOT included. The question for us is, will the original “VARANUS” that was showcased in 2017 be a worldwide release or has it been scrapped? Check out our THAILAND TOY EXPO 2017 RECAP HERE. One expo not to be missed and its FREE ENTRY. You can check out our Facebook live stream videos on our PAGE HERE.